Oh… wait… wrong type of convoy!! 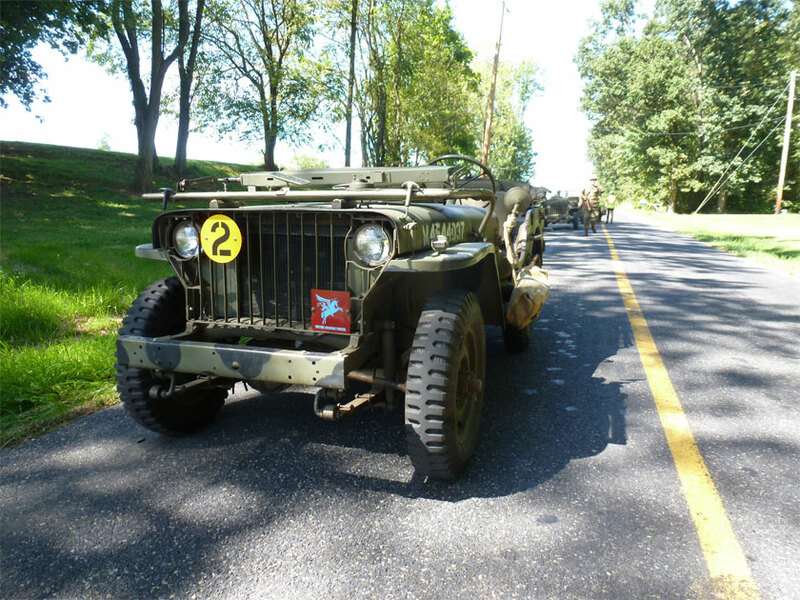 Sept 15 brought around the annual convoy from Eisenhower Farm in Gettysburg to New Oxford, PA. Bob Buker has organised this for several years now and we usually pull in 40 or more WW2 vehicles. We divide up into companies before hand and commanders receive a detailed WW2 style folder with maps and overlays and more. Then we gather up the road from the farm around 7:30 am and prepare to head out. Bob always plans a route that takes us through back country roads with great scenery. You often feel that the current year slips away and you are dropping back in time. We had several fellows come down from Canada including the piper in the photo above. Terry Hunter is the piper and he is an officer in the Canadian Army. 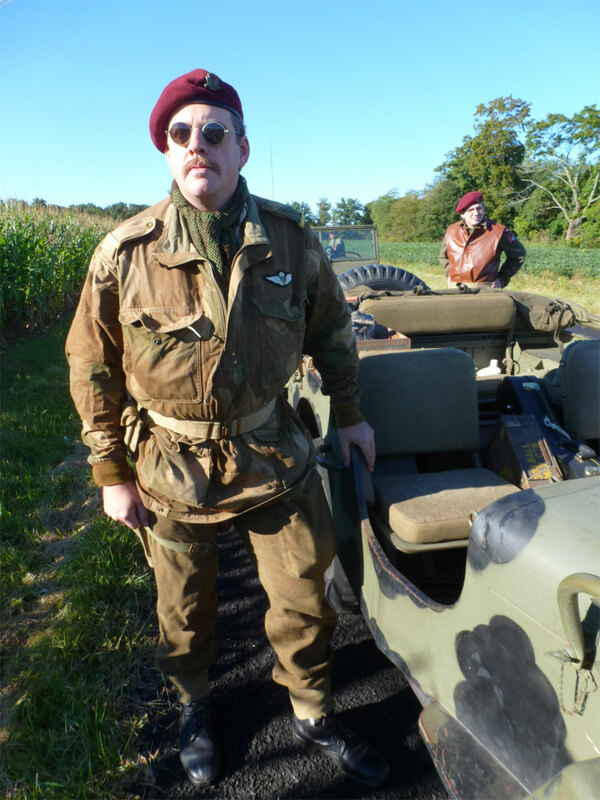 The unit we reenact portrays 1st Canadian Parachute Battalion. 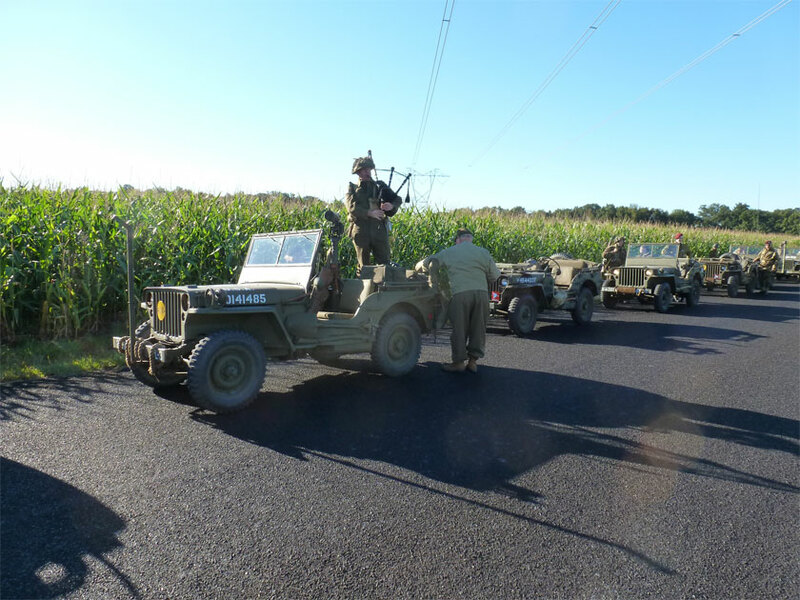 The Canadian embassy heard about us and sent a representative out to the battle at New Oxford that marks the midpoint of the convoy. Below is a shot of myself in 1 Can Para uniform. And here is a shot of the center of new oxford through the smoke. 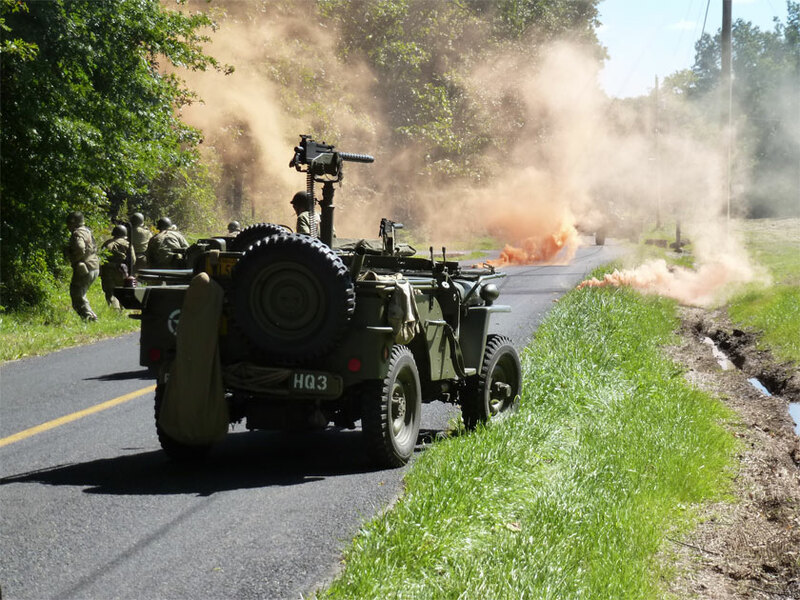 On the way back to Eisenhower Farm we encountered an ambush. This went on for a bit and gave the fellows a chance to fire off some rounds. I am often left wondering what the locals think about this. I can imagine some guy out on his porch with a cup of coffee and then all hell bursts loose in front of him. Not even sure what I would think if I did not do this as a hobby. 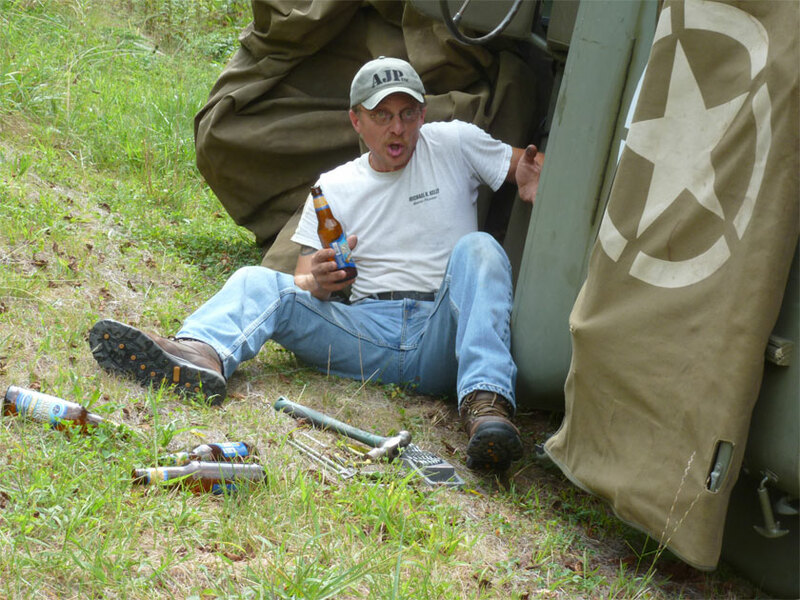 Sadly my Jeep, Mort, began running rough toward the end of the convoy, but as always he got us back to the camp. With alot of work I straightened out a few small issues but in the end had to tow him home. Now he awaits my ministrations. Thanks to my little Jeep for not stranding us!! He is a loyal mechanical companion. 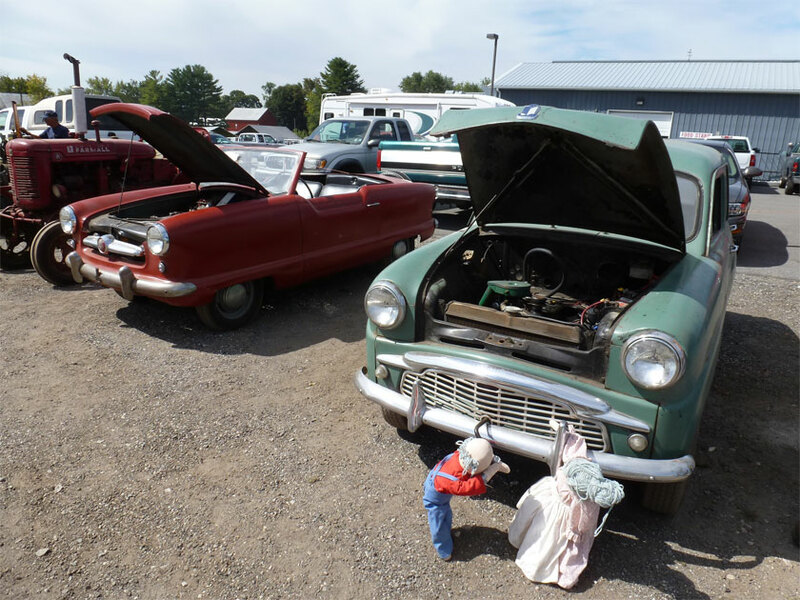 So often we sell our antique cars and never see them again. Sometimes that is for the best. I used to have a beautiful 1967 VW Beetle, black with a red interior. After I sold it the car began to appear in pinups online. I could see what horrible things the new owners were doing to it. A couple years later I began passing it going the opposite direction on my way to work. I could never catch the new owner. Recently I saw it being towed up a local highway and the neglect of the car had been so aggressive that it needed a total restoration. That broke my heart. At the Arcadia steam show I had a happy reunion. Hugo reappeared!!! 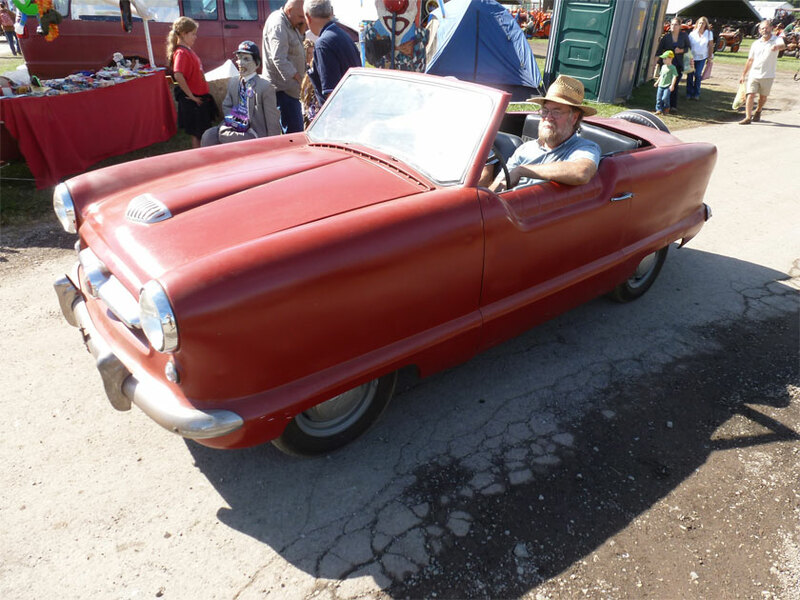 I was looking through some antique tools and looked up to see my electrified 1955 Metropolitan (nicknamed “Hugo”) drive by. I was so ecstatic that I ran after it and my friends had to come find me. The new owner is taking good care of Hugo. He upgraded the electrical system from 48 to 72 volts so Hugo can drive on regular roads. Hugo now lives with a friend, a 1959 Triumph Ten. The Triumph ten has a twin that is being electrified like Hugo. 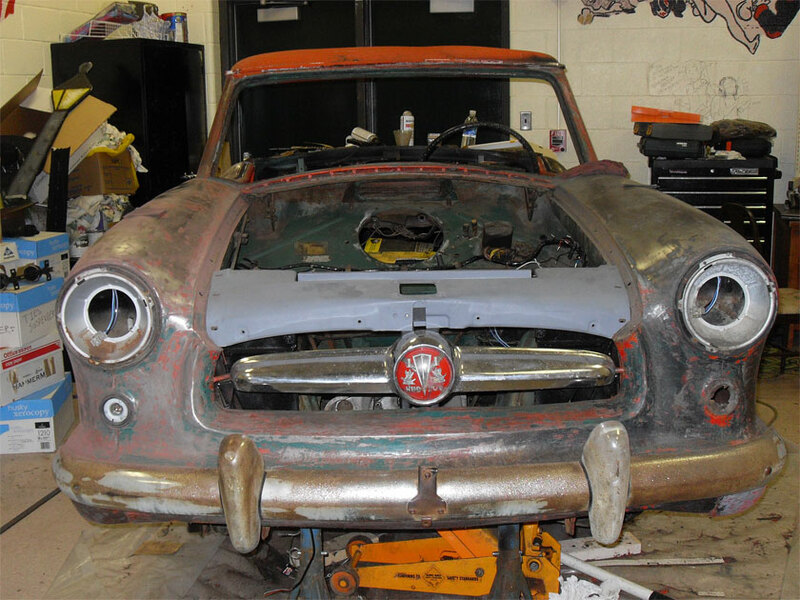 The Triumph here came from California where it was destined for scrap until it was rescued. 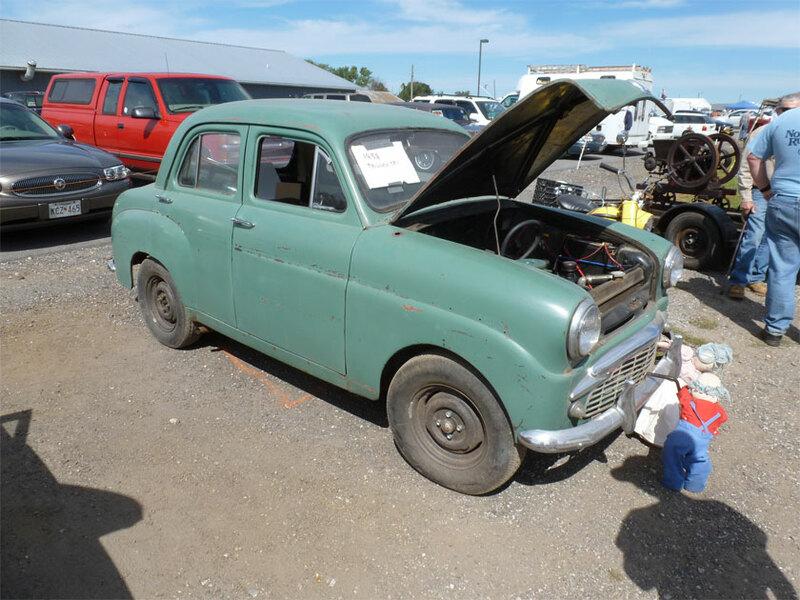 It is a very complete and rare little car. Hugo was a project I did a few years back with my students at Owings Mills High School. In fact one of my current shop helpers, Vlad, was the student who suggested the project. We had rented a battered Metropolitan for the musical “Grease”. Vlad looked at the car and suggested that we could build a better one. Thus the concept of Hugo was born. For more of the story of Hugo and photos of the restoration go to this link on my main web page: http://www.hansonmechanical.com/MetEV/Metev.html It was a very happy reunion seeing this car again, and seeing that the new owner is caring for and enjoying Hugo. 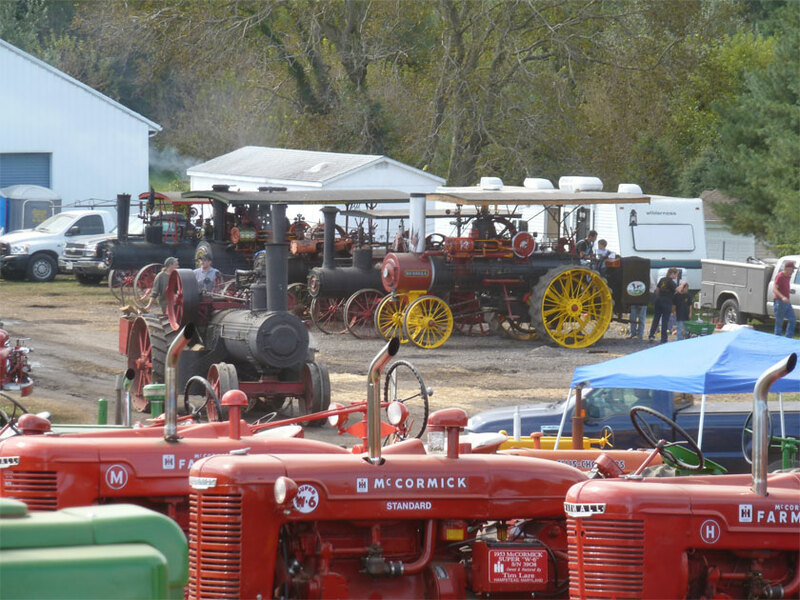 This summer I missed my favorite steam engine show in Lancaster, Pennsylvania at the Rough and Tumble museum. What was I doing? You got it, working on Jeeps! Last weekend my buddy Sean dropped in with his infant son and started talking about going to our local Steam and Gas engine show that morning. I had forgotten all about it! Why? Jeeps!! So, this morning I managed to escape the shop for a bit and make it to another steam show nearby at Arcadia. I rarely make it to this one because I am usually at an event in Gettysburg. But I needed my ancient machinery fix. Mike picked me up this morning and we headed a few minutes down the road to meet Sean at ancient machinery Mecca. 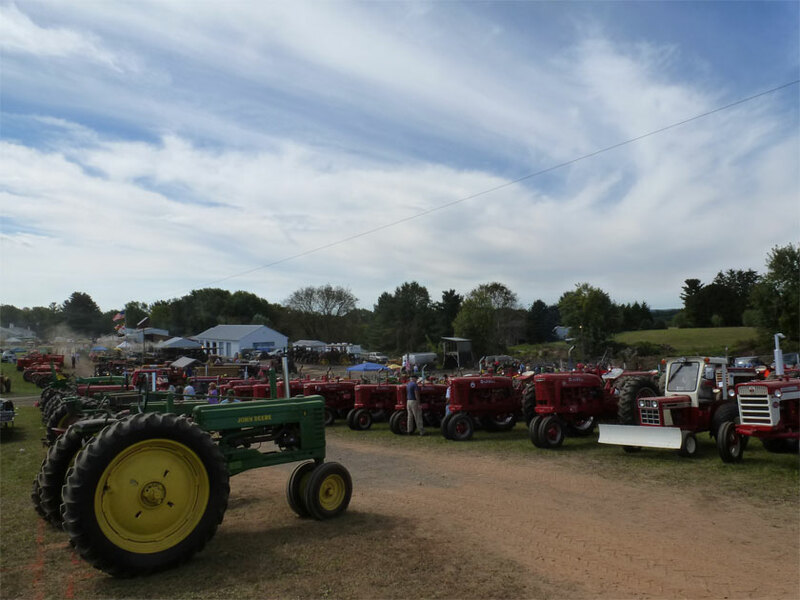 This is not just an antique tractor show. Let’s look a bit closer at what is in the background. Yes, I think I see steam engines back there!! I am truly happy when I get a chance to spend time with these ancient machines. The scent of the coal smoke is wonderful as it wafts through the air. I had the chance a couple times to drive these ancient behemoths. The steering is done through chains and you truly have to think ahead as you drive. To steer something that large as it chugs along is a memorable experience. It takes real dedication to own and care for one of these machines. Boilers must be tested and cared for. You have to own a space large enough to keep them in, and have a method of transporting them. They are truly wonderful machines and most people find it amazing how quiet they are. Unfortunately I did not have alot of time so I wandered off to see what other mechanical artifacts had come out into the sun for the show. 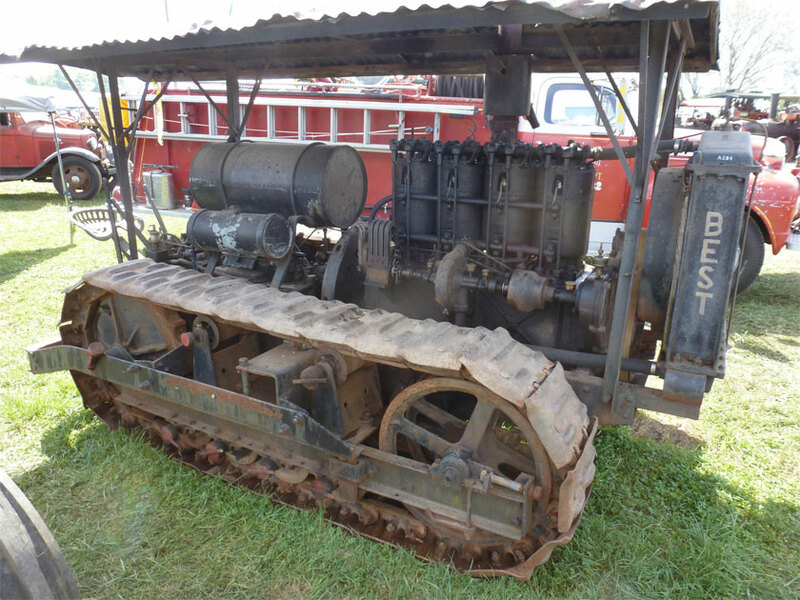 Below is a 1917 Best crawler. This comes from the Barnes collection. The Barnes house their extensive collection on their property next to our workshop in Gamber. 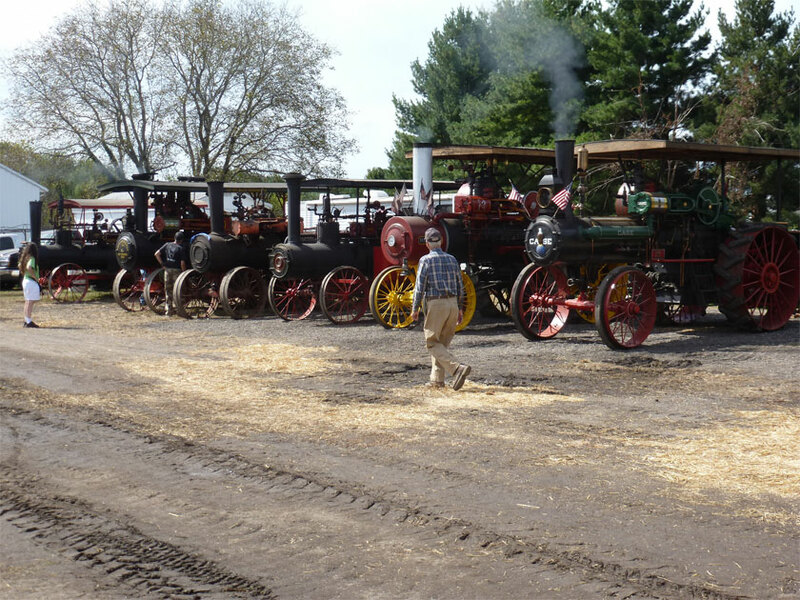 Over the past few weeks I have heard the old engines being fired up and readied for the show. 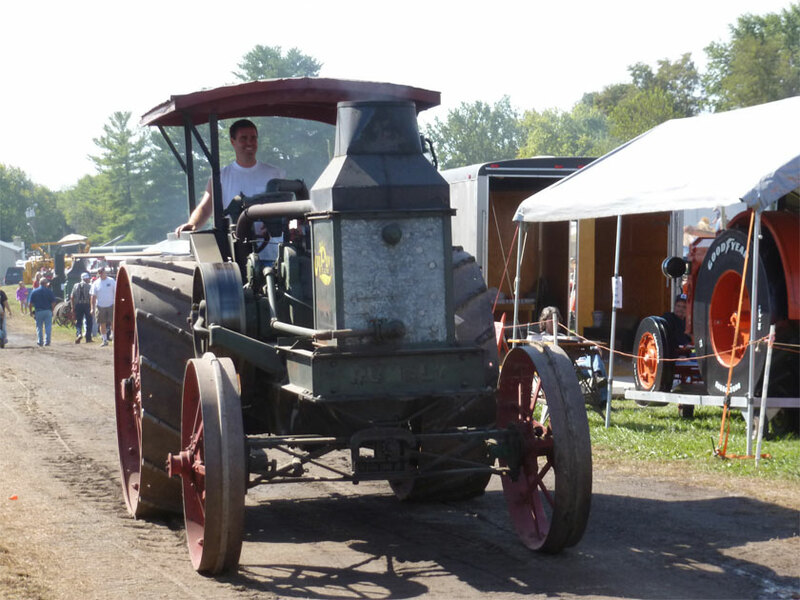 This fellow looks very happy driving his Rumley kerosene tractor. 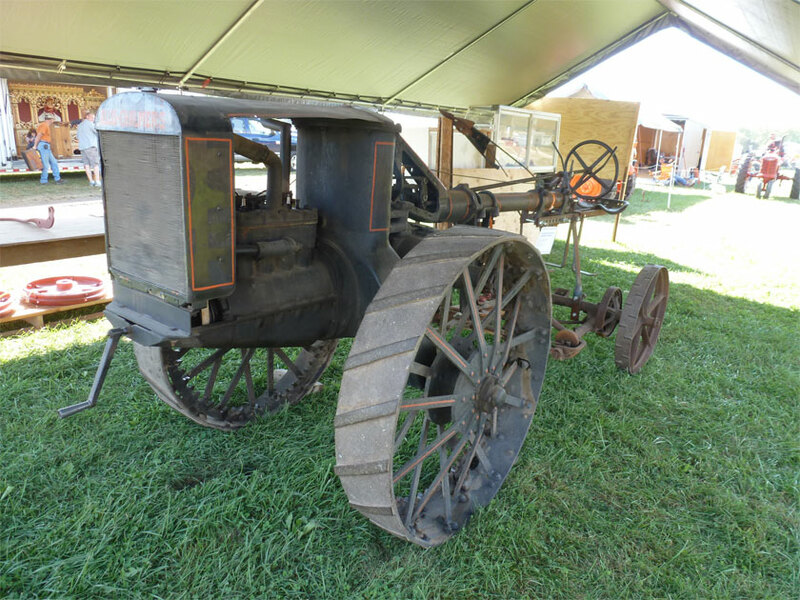 The show is also littered with other examples of early engineering like this Allis Chalmers tractor. This is not what we are used to tractors looking like today. I only had a couple of hours to gaze at the machines and explore the flea market but I am glad I took the time. I got at least a little of my ancient engine fix for the summer. IMA held a premier on September 7th of their new TV show “Family Guns”. They pulled out all the stops with a huge screen on the lawn in front of the warehouse, wonderful food, tables under a tent, and an open warehouse to explore. 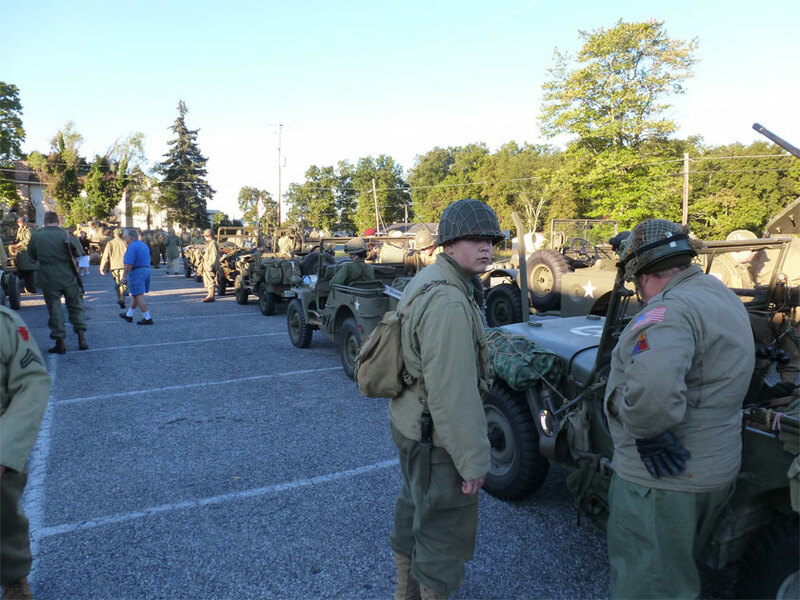 WW2 military vehicles were lined up on the grass. 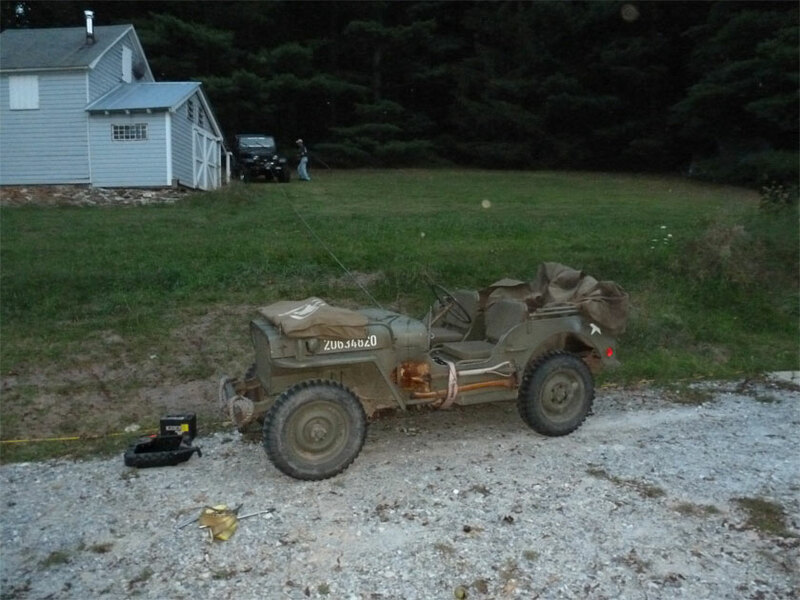 Below is a shot of the Jeep we rebuilt for them next to a “Seep”. I took my friend Randy’s wife and son. Laurie looked at the Seep (the Jeep version of a Schwimmwagen) and immediately nicknamed it the “duckling” That just gave me a wonderful image. 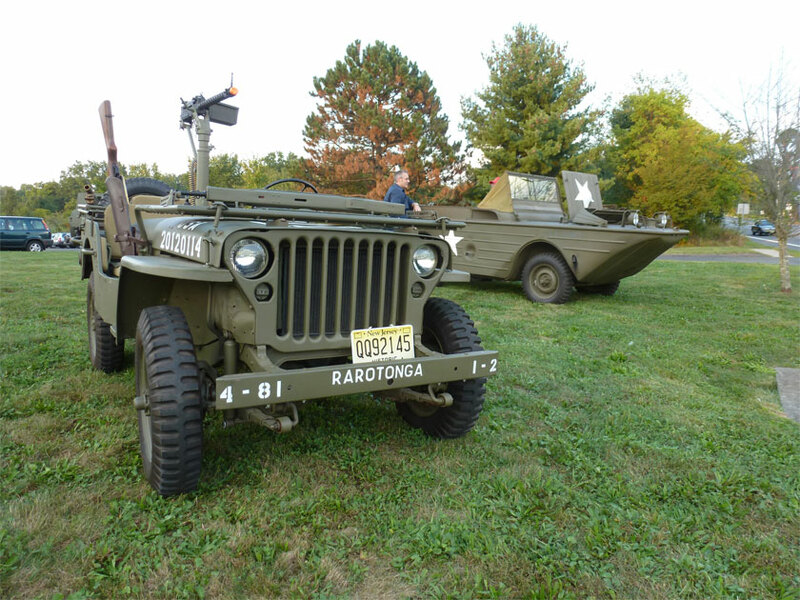 Picture a WW2 DUKW surrounded by a bunch of these “ducklings”!! Below is a shot of Chris, Paul and I with the 1945 GPW. Happily the warehouse was open to the public. 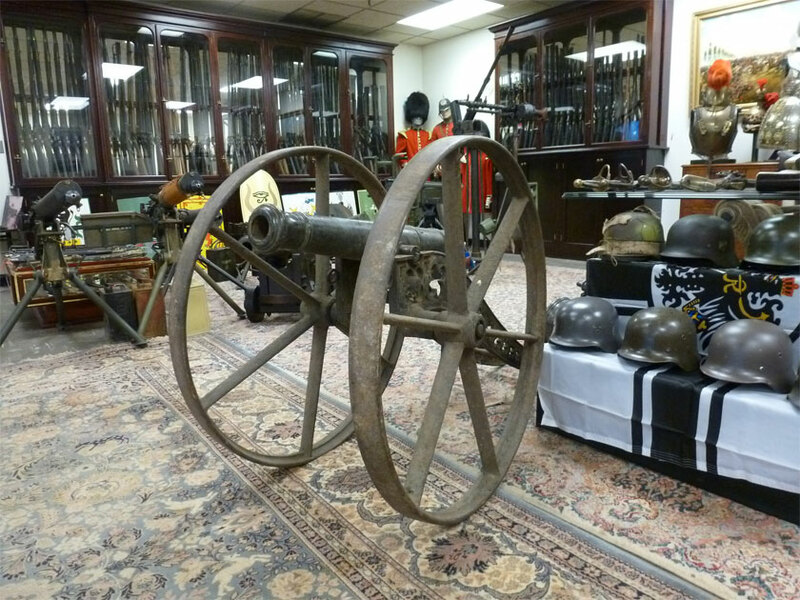 Randy’s son was in heaven exploring all the WW2 German gear. 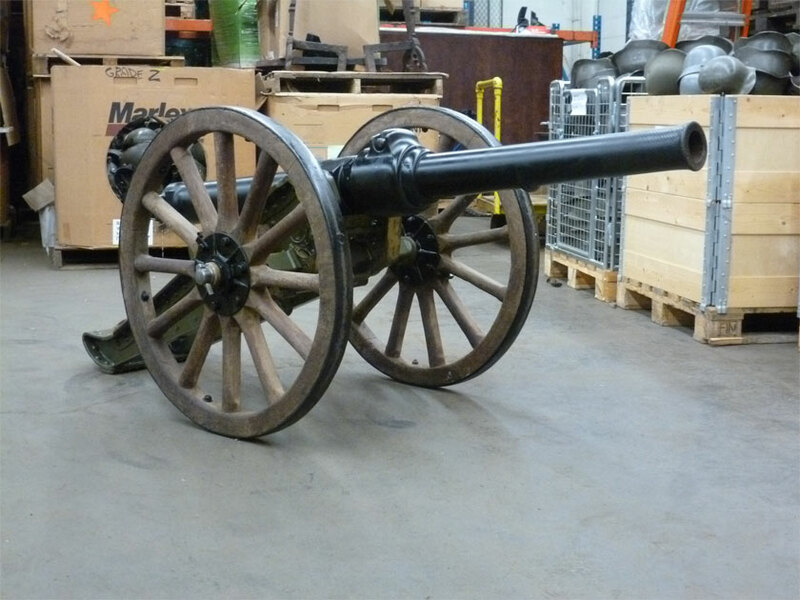 The British cannon below was just one of many beautiful pieces in the warehouse. And here is a shot in their main showroom. The first episode of the show aired this evening and was great fun to watch. Make sure to catch our episode on Sept 26th at 10pm. Just a note on prices represented on the episode (before people start looking for a deal!!) Pricing did not include items taken in trade. 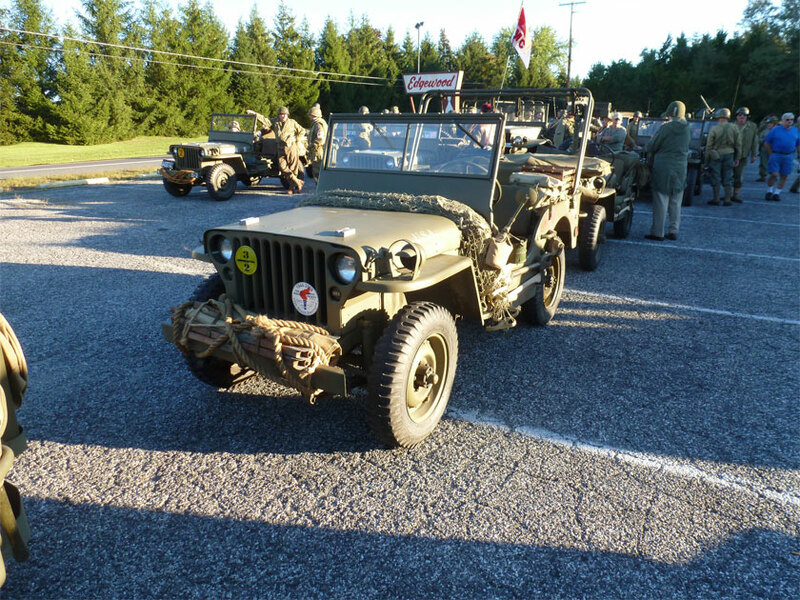 Plus this Jeep had an immaculate drivetrain including a rebuilt engine and many original F script parts. 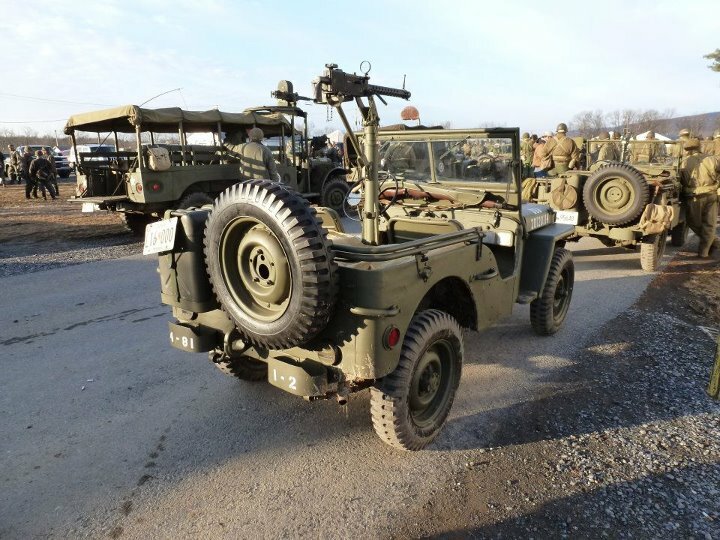 So the main overhaul of the Jeep included major frame welding, steel work on the body, and then it was a huge amount of cosmetics and re-assembly. 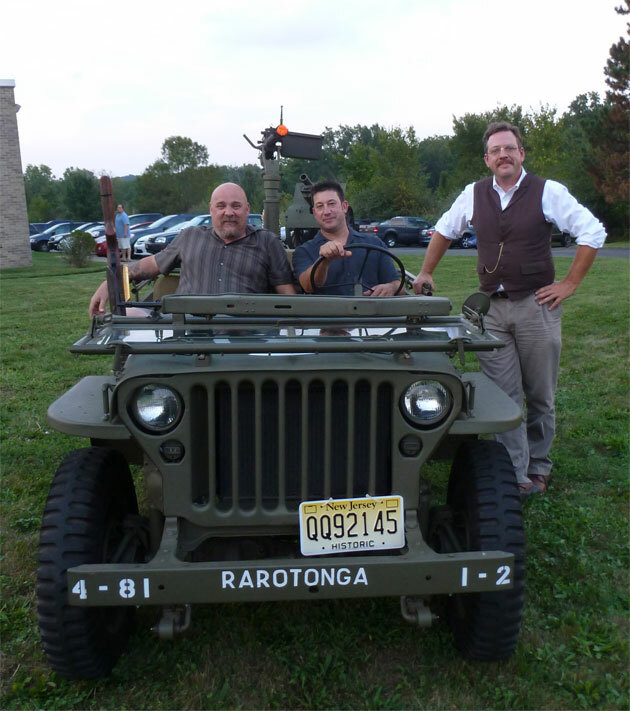 In December of 2011 Hanson Mechanical rebuilt a 1945 ford GPW for International Military Antiques of Gillette NJ. 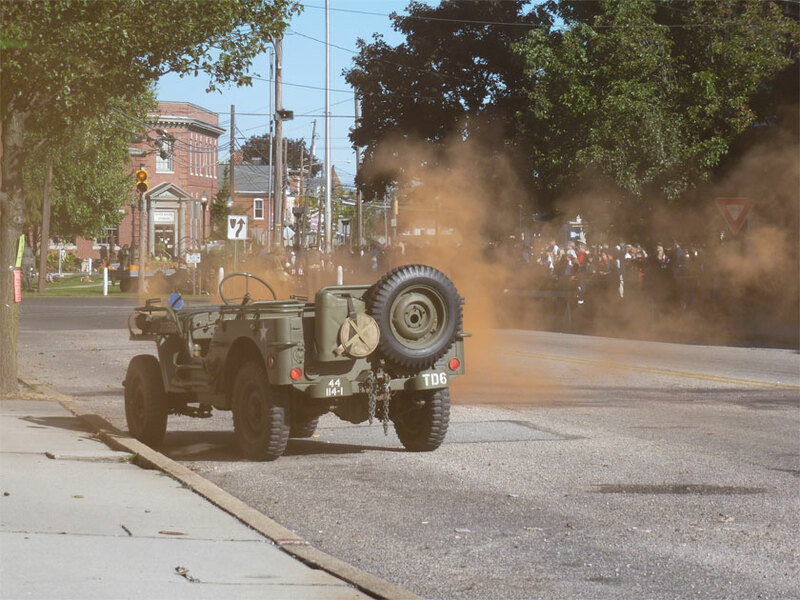 The rebuild, and use of the Jeep in a reenactment will be on their new TV show, Family Guns. 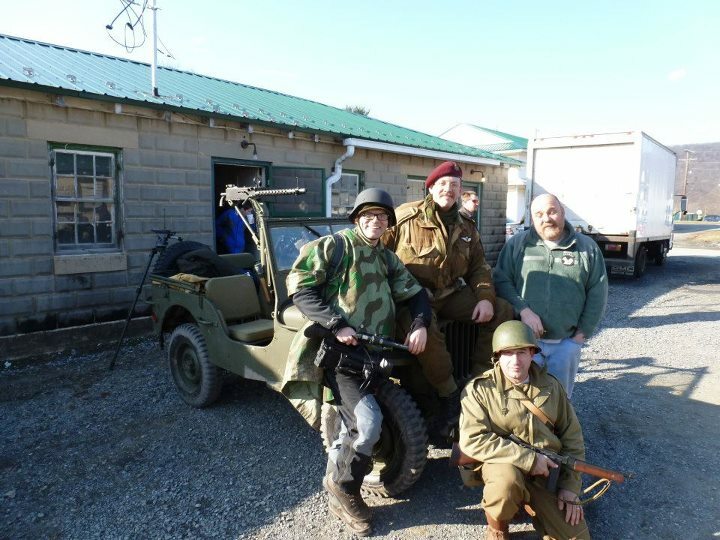 Below is a shot of the director, myself, and two of the IMA fellows after filming at a WW2 reenactment in January. The show premiers in the US next week on the National Geographic channel at 10:00 on September 12th. The episode featuring our Jeep rebuild is called “I want a Jeep.” That episode will air in the US at 10:00 on September 26th. I have an international release schedule as well and will update this post with that information as soon as I have a chance. 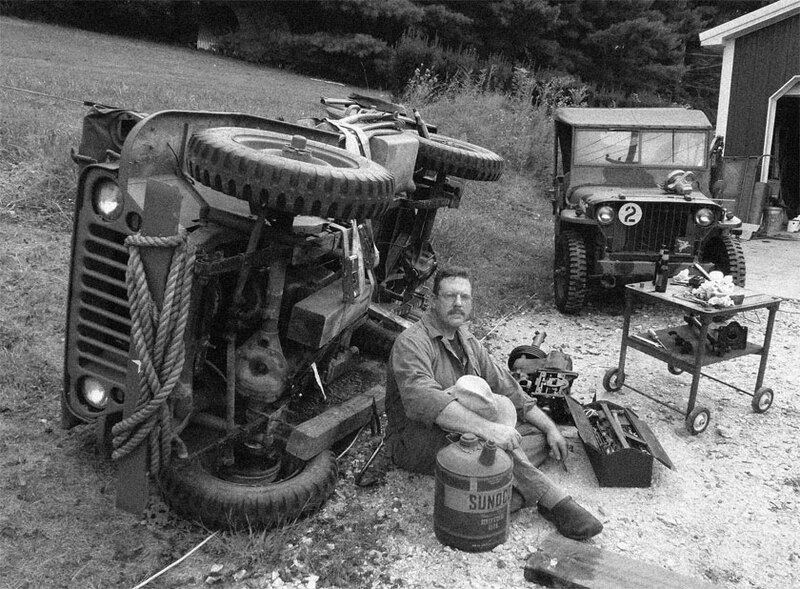 Fixin’ a Jeep old school style! Every now and then an opportunity comes along which you cannot ignore. And sometimes you think about the opportunity and wonder if you should be an intelligent human being and ignore it. Well, we took the opportunity just to say we did it. A customer dropped off a Jeep needing transmission work. I believe he was inspired by the photo below when he told us to flip it on its side if we wanted to. During WW2 if you had a bunch of fellows with nothing to do, and wanted easier access for a repair I guess this was an option. 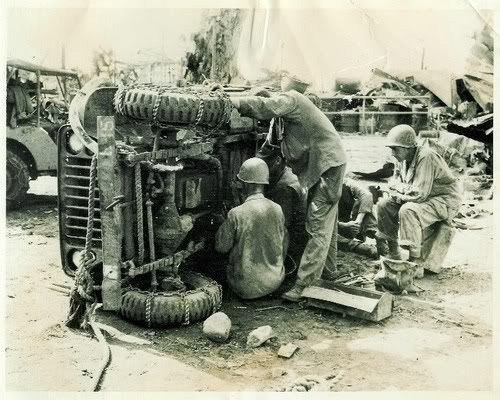 I have seen several other photos of mechanics tipping and flipping Jeeps for repairs. 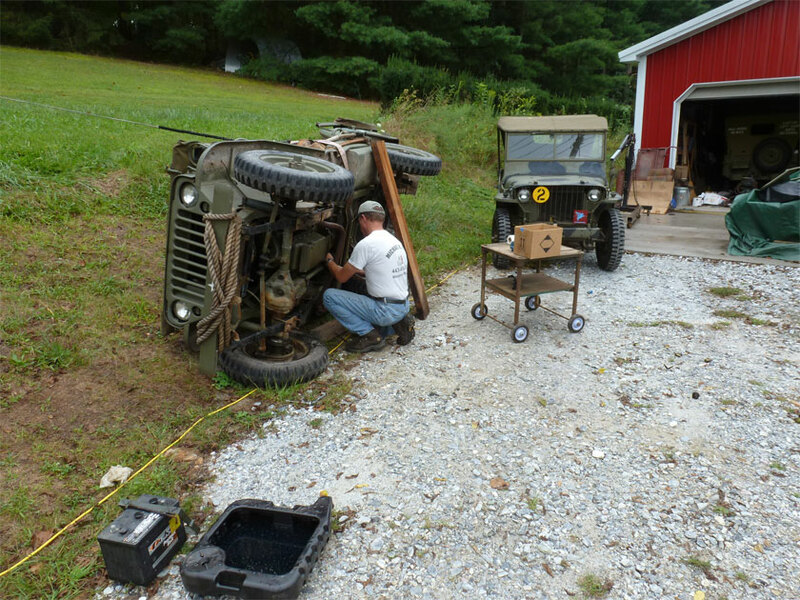 Since none of us are young (but we are obviously sometimes stupid) we used a Jeep and winch to bring this Willys MB up on its side. Once it was on its side we set about removing the offending transmission from beneath. There are several things one must think about when doing this. First is blocking the engine in place. 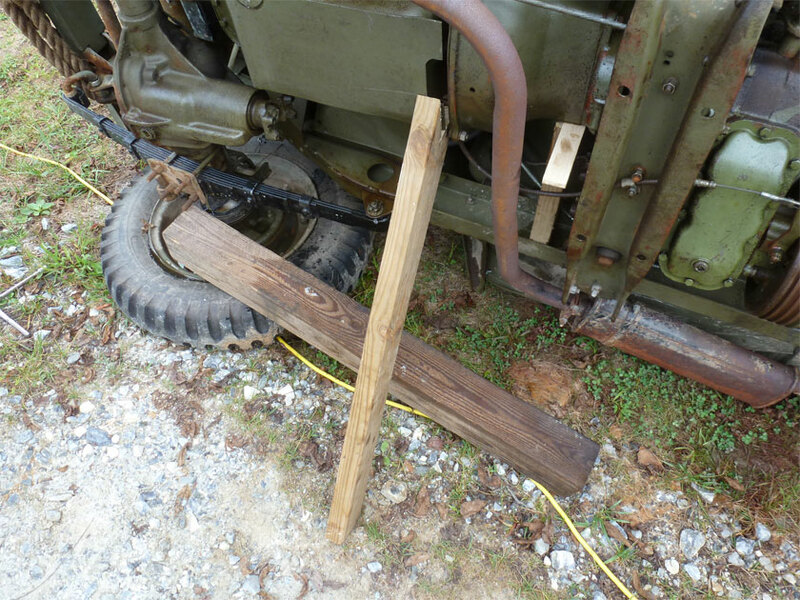 With shims and wood cut to size we set up a “field expedient” set of blocks to keep the engine from falling out. Later we would strap it in place with heavy straps and a 6 by 6 piece of lumber. Here is Mike getting to work removing the transmission. Removing the transmission and transfer case gave us alot of time to think about the wisdom of what we were doing. If you had a group of young, healthy fellows you could perform the removal easily. However, installation would really not work this way. You would not have enough control when maneuvering the transmission back in place. At that point we strapped the engine in and decided to lower the Jeep back down. But not before taking some great vintage pictures. Below is a photo of myself after removing the transmission. What did we learn from this? First off tipping the Jeep did NO damage to the body, I am impressed. I did make sure to drain all fluids and remove the battery before tippping. While as a field expedient this might make work on driveshafts and such easier, it is not a practical method for swapping a transmission. And I must emphasize, PLEASE DO NOT try this at home. We are professional idiots 🙂 Stay tuned as I will be updating this post later with a video of lowering the Jeep.